*ACDIS Members receive $100 off! Discount will automatically be deducted in your cart. Note: you must be logged in to the HCPro marketplace in order to get your ACDIS discount. Order ACDIS CDI Apprenticeship and get a 1-year ACDIS Membership for just $99! You will receive your ACDIS Membership Coupon Code after you place your order. The Association of Clinical Documentation Improvement Specialists (ACDIS) is proud to launch a new certificate program for those seeking to enter the clinical documentation profession. The ACDIS CDI Apprenticeship is a certificate program comprised of foundational CDI education paired with a review of core compliance and ethical principles. Candidates who pass the final exam receive a certificate of CDI foundational training and are allowed to designate themselves as an ACDIS-Approved CDI Apprentice. 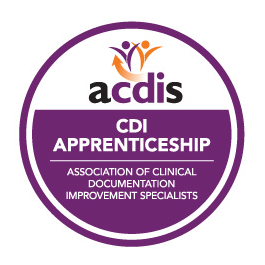 Why become an ACDIS CDI Apprentice? The ACDIS CDI Apprenticeship demonstrates that an individual has foundational CDI knowledge and has familiarity with the ACDIS Code of Ethics and other guiding principles for compliant query practice. Individuals who pass the final examination are allowed to use the designation ACDIS-Approved CDI Apprentice in their resumes, biographical information, or email signatures. Designation as an ACDIS CDI Apprentice demonstrates to potential employers that an individual has foundational knowledge of CDI. The ACDIS CDI Apprenticeship has also been designed as a pathway to future Certified Clinical Documentation Specialist (CCDS) designation. Candidates interested in obtaining the CCDS credential must fulfil prerequisites, including at least two years of experience in clinical documentation improvement. The ACDIS CDI Apprenticeship can be used as a pathway for progression toward the goal of CCDS certification and those who participate in the ACDIS CDI Apprenticeship will receive regular networking opportunities, special offers on further education, and support to continue on the journey. What does the ACDIS CDI Apprentice comprise? The training includes five modules devoted to key concepts and responsibilities of CDI specialists, four modules devoted to clinical conditions that every CDI specialist must master, and one module devoted to core ACDIS guidelines, including the ACDIS Code of Ethics and the AHIMA/ACDIS Guide to Compliant Query Practice. Each module is followed by a quiz on that module’s topics. Only after successfully passing all 10 modules does an individual receive the certificate stating they have demonstrated knowledge of foundational CDI education. Understanding the DRG and IPPS Systems: Describes how to assign MS- and APR-DRGs, how hospitals are paid under the IPPS, and the nuances of the Medicare reimbursement system. Coding Essentials for the CDI Specialist: Provides an overview of principal diagnosis, reportable secondary diagnoses, and ICD-10. Also includes a brief concept overview of present on admission and hospital-acquired conditions. Conducting the Health Record Review: Describes how CDI professionals should interrogate the medical record, identifying which sections are most important, which documentation can be used for coding vs. querying, and where to find clinically relevant data. Introduction to Queries and the Query Process: Provides guidance on how to formulate an effective, compliant query, and reviews major industry developments in query standards and compliance guidance. Documentation Requirements for Sepsis: Explains the difference between SIRS and sepsis, identifies clinical indicators for sepsis, and discusses the AHA sepsis coding guidelines. Documentation Requirements for CHF: Differentiates between heart failure type and acuity, and explains the AHA coding guidelines for heart failure. Documentation Requirements for Acute Respiratory Failure: Identifies the clinical indicators and explains AHA coding guidelines for respiratory failure. Documentation Requirements for Malnutrition: Differentiates between the types of malnutrition, identifies the diagnostic characteristics for adult malnutrition, and explains the AHA malnutrition coding guidelines. Each course in the library is highly interactive, with voice-over narration, and includes “Test Your Knowledge” questions throughout to reinforce major concepts. In addition, each course concludes with a final exam consisting of 10 multiple-choice questions to ensure that the user has mastered the content. You will have access to your ACDIS CDI Apprenticeship for 180 days from the purchase/order date. This program has been approved for 9 continuing education units for use in fulfilling the continuing education requirements of the American Health Information Management Association (AHIMA). HCPro is accredited as a provider of continuing nursing education by the American Nurses Credentialing Center’s Commission on Accreditation. This educational activity for 8.4 nursing contact hours is provided by HCPro. This program has been approved for 9 continuing education units towards fulfilling the requirements of the Certified Clinical Documentation Specialist (CCDS) certification, offered as a service of the Association of Clinical Documentation Improvement Specialists (ACDIS). Disclosure Statement: HCPro has confirmed that none of the faculty/presenters, planners, or contributors have any relevant financial relationships to disclose related to the content of this educational activity.